The New Order is the latest in a series that goes back to 1981. 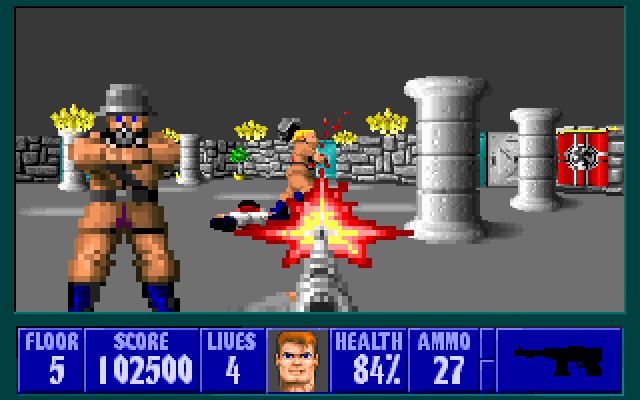 Unfortunately, even though I owned a Commodore 64, I didn't play Castle Wolfenstein. It was available on the early system, among others. My first initiation with this classic was with Wolfenstein 3D on my little IBM PC in 1992. 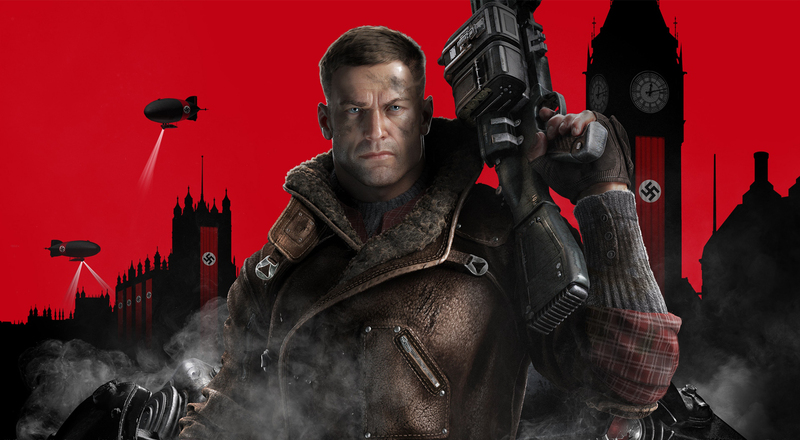 In it, you play as Captain B.J Blazkowicz, captured by the Nazis and trying to escape from one of their castles. It was available as shareware (a free game, for those of you born after 1977 unlike me) and is generally credited with being one of the first games to popularize the first-person shooter genre. I spent weeks, neigh months playing this literal game-changer. It was my original experience with the first-person shooter and my memories are fond, to say the least. Therefore, you can understand why I was noticeably reticent when I heard that they were re-vamping the series yet again. A version of the series came out for the XBox 360 and PlayStation 2 in 2009 to mediocre reviews that generally left fans looking for more. That's why when a new version came out for the XBox One, I had my doubts. That said, I was generally pleased with the result. For one thing, Bethesda Softworks took the reigns. The publishers of personal favorites Fallout and The Elder Scrolls helped to put my mind at ease. For another, the premise is scrumptiously crunchable. It takes place in an alternate universe in which the Nazis won World War II by nuking the U.S. Who couldn't get just a little bit excited about this Tarantino-esque re-writing of history with twinges of childhood nostalgia thrown in for good measure? Only a true Nazi, that's who! what kind of world did hitler create? Hitler created a pretty awful place to live, to literally no one's surprise. It's mostly concrete and the Beatles sing neo-nazi ditties because it was that or go to the death camps. When returning as B.J. Blazkowicz, you have been in a coma for over 14 years. You went into the coma in 1946 and didn't come out again until 1960 when the asylum you've been living in is being "liquidated." The kindly old doctor and his wife were killed along with the rest of the patients. The only survivors are their daughter and Blazkowicz, who conveniently wakes up just in time to kill a few Nazis, save her life, and escape. You have to be able to suspend a little disbelief to enjoy this one, like forgetting that people who have been in comas for fourteen years can't walk, much less snap necks and fire automatic shotguns within minutes of waking up. However, if you can perform this minor feat of mental gymnastics, you're in for a good time. You eventually meet up with the resistance and take the fight to the Nazis and General "Deathshead" Strasse. With nearly everything coming out these days having one including games that probably shouldn't like Grand Theft Auto and Red Dead Redemption, it is refreshing to see a game choose to put all of their effort into creating a quality singly player instead of spending time and effort to make a mediocre and unecessary multiplayer component. According to senior gameplay designer Andreas Öjerfors, the game doesn't contain a multiplayer due to a desire to create the best single player experience possible. "If we could take every bit of energy and sweat the studio has and pour all that into the single-player campaign, it gives us the resources to make something very, very cool, compared to if we would also have to divert some of our resources to making multiplayer." In my humble opinion, not enough games make this tough decision today. I realize that the replay-ability rises considerably when companies take this step, but not every game is designed for a multiplayer experience. In the aforementioned Grand Theft Auto, we all played the game with the same single character(s). It simply makes no sense for us all to take the protagonist(s) into a multiplayer game. The math just doesn't work. Even with number five's three main characters, it still felt awkward. With games like Call of Duty and Titanfall that have chosen up front to be multiplayer games, I say run with it. However, there are plenty of titles out there that have a multiplayer that feels tacked on. With these games, they should have just focused their time and energy on the campaign. Instead, you end up with two halves that don't make a whole and a game that feels unfinished. Sometimes adding a multiplayer just because you can takes away from the overall experience and simply shouldn't happen. This game was a whole lot of fun. I don't see it winning any Game of the Year awards, but that doesn't mean it wasn't worth picking up. The gameplay is solid. The graphics are impressive, if not mind-blowing. The alternate-history aspect of the story line is intriguing. All-in-all, this is a really good game. I won't go so far as to call it great, but I have trouble when trying to find any flaws in this one. Give it a look. You won't find a reason to be disappointed. Bonuses: +1 for the use of an alternate universe where the Nazis won WWII. Re-writing history is a winning proposition as proved by Inglorious Basterds. Penalties: -1 for the need to suspend your disbelief on a regular basis. Once or twice is okay. Every two minutes is a bit much.